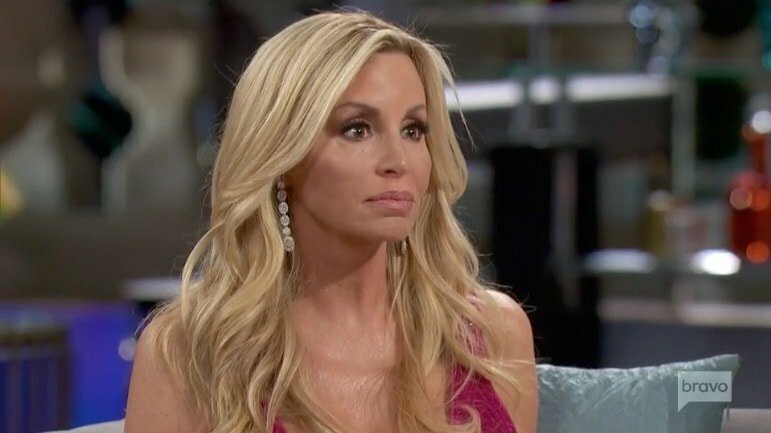 Isn’t it great to be seeing more of Camille Grammer this season on Real Housewives of Beverly Hills? She always adds a little something extra to the show. A bit of levity when things get crazy. And just the right amount of snark. Hopefully, Bravo will share some of her recent wedding to David C. Meyer on an upcoming episode. It is nice to watch Camille experiencing some joy, as her life has often been challenging since becoming a Housewife. Camille has faced many adversities over the past nine seasons of Beverly Hills, including an ugly divorce from Kelsey Grammer, a battle with cancer and the recent loss of her home in the Woolsey Fire in Malibu. One sensitive matter that has not come up in the media lately is Camille’s alleged assault by then-boyfriend Dimitri Charalambopoulos in 2013. Now, Camille is asking for a media ban when the case finally goes to trial next month. Real Housewives of Beverly Hills star Camille Grammer’s life has been a mixture of joy and sadness. Camille wed David C. Meyer in Hawaii in October of 2018. Castmates Teddi Mellencamp Arroyave, Dorit Kemsley, and Lisa Rinna attended the wedding. 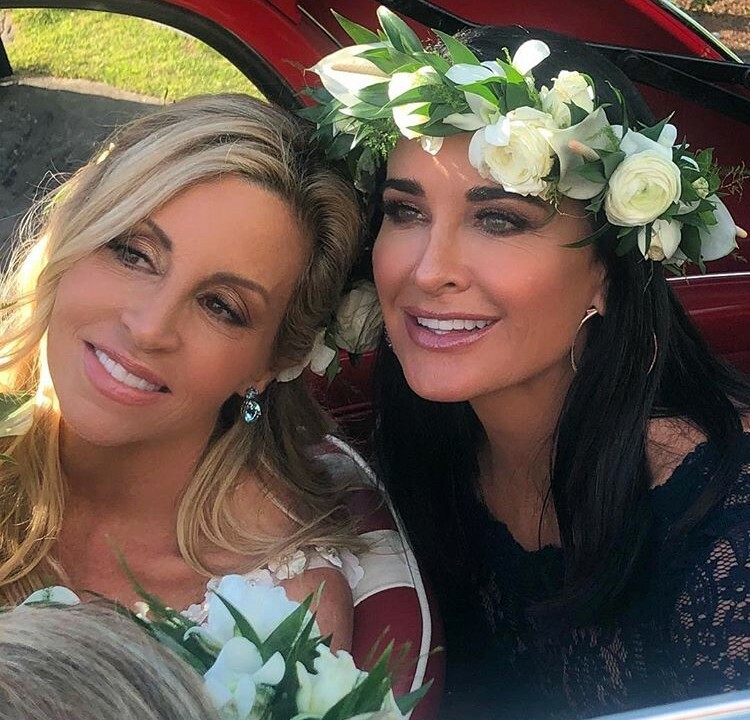 Kyle Richards served as one of her bridesmaids. Since they were bitter rivals in Season 1, their current friendship is a miracle delightful surprise. No one watching Season 1 of Real Housewives of Beverly Hills would have predicted that Kyle Richards would be a bridesmaid in Camille Grammer’s wedding. Then again, no one at the beginning of that season knew that Camille and Kelsey Grammer would get divorced. Of course it is going to be major news when a Real Housewife gets married. This is especially true for super villain turned fan favorite Camille Grammer. After watching the scandalous end to her marriage during Real Housewives of Beverly Hills Season 1, everyone in the fandom has been rooting for her to find happiness. It looks like her wedding to David C. Meyer was filmed for the show and she looks very happy in the photos, but there is definitely some drama brewing behind the Instagram posts. In Season 1 of Real Housewives of Beverly Hills it was a big deal when Camille Grammer went to Hawaii without her then-husband Kelsey Grammer. It was a major storyline that season and a major point of contention with then-rival Kyle Richards. Now life has come full circle for Camille. She got married to David C. Meyer in Hawaii and Kyle stood by her side as one of her bridesmaids. Oh how things have changed. The Camille Grammer that we “met” during Season 1 of Real Housewives of Beverly Hills is back on our television screens. Well, at least the aspects that made for amazing TV. She’s left the negative attributes in the past. This time around, Camille is on the right side of history (i.e. putting Dorit Kemsley in check) and it is everything. Camille is back on her game and new cast member Teddi Mellencamp Arroyave is adjusting to the Housewife life. They both joined Andy Cohen in the clubhouse to discuss all of the latest Beverly Hills drama during their joint appearance on Watch What Happens Live. As much as Dorit Kemsley is annoying me this season on Real Housewives of Beverly Hills (i.e. a whole lot), she is the only one giving us something to talk about every week. Sure, most of us are hating on Dorit for drunkenly calling Camille Grammer a “stupid c-nt,” but that’s a lot more interesting than watching gratuitous self promotion, home construction, and glam squads week after week. Camille is opening up about Dorit’s rudeness, her engagement with David C. Meyer, and her first marriage with Kelsey Grammer.